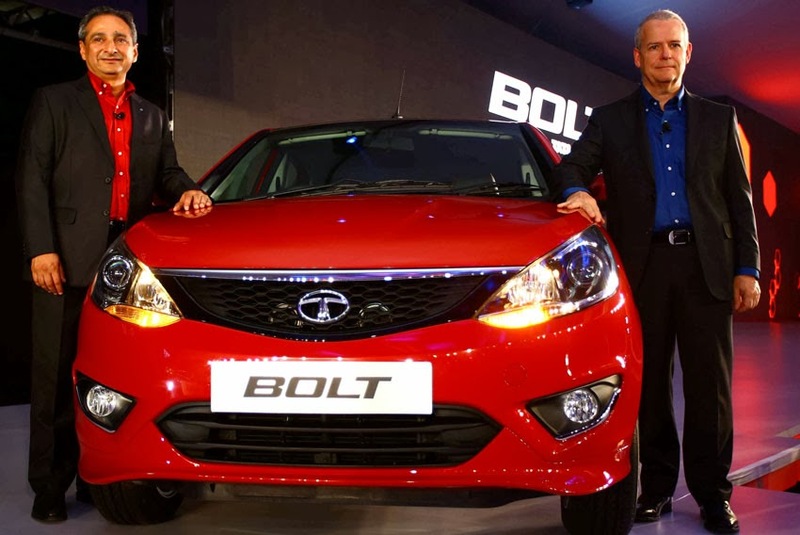 Tata Motors unveiled two all-new cars - the classy sedan, Zest and the sporty, dynamic premium hatchback, Bolt that look to redefine the passenger car market with new design aesthetics, segment-defining drive experience and high-tech Infotainment system. Zest clearly signifies enthusiasm for life, for the sense of excitement, anticipation, and energy it brings, approaching life as an adventure. It is all about being vivacious and energetic. Those who have Zest exude excitement and energy while approaching life and that is the new Zest Sedan, in character. Bolt with the name signifying speed, it represents an attitude of winning, and staying ahead. This attitude is embodied in the all-new Bolt in all aspects of design, drive and seamless connect. "We at Tata Motors are delighted to showcase to the global market the much awaited next generation cars - the Zest, a stunning and exciting new compact sedan and the Bolt, a dynamic hatch. These cars have been engineered for global markets, through global teams across India, UK and Korea to set new standards in their respective segments. These cars are a true representation of our Horizonext philosophy, with best-in-class offerings for performance that yet offers economy and efficiency," said Ranjit Yadav, President, Passenger Vehicles, Tata Motors. Zest and Bolt have been designed and developed based on three key fundamental principles, namely, DesigNext, DriveNext, ConnectNext. Zest and Bolt, a result of the collaborative design inputs from the three Tata Motors design studios in Pune, Coventry (UK) and Turin (Italy), come with several segment first features and a new design language on the exterior and the interior of the car. The company has introduced a new design language - DesignNext - that gives an expression to an excellent combination of sleek, smart styling and enhanced comfort that increases driver productivity. The new design language distills the fine points of auto design with cuts and lines that accentuate the modern India and its global citizens. The new design semantics include the new Tata signature grill with new the Humanity Line, visually flowing into the dynamic headlamps to create a unique design signature for the brands. With flowing lines that create an illusion of movement even when the car is standing still, its exterior exaggerates size to give it a feeling of a larger hatchback or a sedan. In the Zest the projector headlamps complemented by chrome accents, the daytime running lights, the rear treatment of LED lamps, the trendy 15-inch alloy wheels, combined with a signature Buzz Blue colour, add up to a dynamic and stylish pouncing stance. Matching aesthetic design with function, the Bolt's floating roof spoiler not only provides an extra-sporty touch but also aids in aerodynamics. The sporty, confident look is further enhanced with fog lamp Bezels. The interiors of both these cars are geared for a premium feel. The driver-focused dashboard architecture carries premium chrome embellishment to render the cockpit with an aura of elegance. The instrument cluster and the central AC vents are connected in a single wing-shaped graphics. DriveNext, is a new approach to the driving dynamics that offers driver complete control of a highly responsive machine. The Zest and Bolt will be powered by the segment-first, Turbocharged Intercooled Multi-point Fuel-Injected (MPFi) petrol engine, Revotron 1.2T, which brings revolution in refinement, performance and economy. The diesel variant of Zest will have the first-in-class F-Tronic technology-enabled, 5-speed automated manual transmission and will be powered by a segment-leading 90 ps engine with 200 Nm of uninterrupted flat torque to offer a peppy drive with seamless delivery of power. Further, both Zest and Bolt will have EPAS (Electronic Power Assisted System), with 'Active Return' function and speed sensitive power steering - a first for both segments. New advanced ABS for improved braking efficiency and with yet another segment-first, the Cornering Stability feature, add to the safety features of the vehicle. A silent, quieter cabin will ensure a pleasant and superlative drive experience. The Dual-path suspension coupled with a zero pivot subframe ensures smooth and comfortable ride. The improved suspension provides effective isolation from road inputs without compromising on the body control, translating into a class leading balance between ride and handling. This provides for a very comfortable but engaging drive experience. With ConnectNext the company will deliver a new level of driving and ownership experience as users from their own smart device, can not only enjoy superior quality of entertainment, control the deliverance of all ergonomics, acoustics and climatic needs, but also get access to outside world seamlessly, with a touch. Recognising the dynamic consumer world where connectivity is an increasing need for all, Tata Motors has associated with Harman for designing the infotainment and audio acoustics system and with MapmyIndia for next generation navigation & location based services. With the 5-inch touchscreen supporting rich multimedia experience, advanced Bluetooth technology, smart voice recognition, advanced smartphone integration, supporting phone enabled navigation, social media integration, touch phone controlled interface, the Zest and the Bolt will ensure these car users could seamlessly integrate their professional and personal lives into their commute and travel, while bringing in an unparalled infotainment experience. The system has in-built HVAC controls, which is a first-in-class experience for all consumers. Manufactured on a completely enhanced X1 platform, the Zest and the Bolt mark a strategic shift towards a global portfolio of cars designed to offer high performance and connectivity. These cars will be launched in 2014 in India and subsequently in other countries.